Italian Sausage and White Beans with Sage won’t win any beauty contests, but this dish is pure Italian comfort food. If you want a more carb-conscious version, double the sausage and cut the amount of beans in half! Click to see The BEST Instant Pot or Pressure Cooker Baked Beans Recipes! Click here for The BEST Slow Cooker Baked Beans from Food Bloggers! Admittedly this dish of Italian Sausage and White Beans with Sage won’t win any beauty contests, but I promise you’ll love this dish if you like these flavors, and if you have sage growing in your herb garden, I’d consider this a “must make” dish for this time of year. You can cook the beans in the slow cooker earlier in the day if you like, or cook beans in the Instant Pot and then finish the dish in the slow cooker or Instant Pot, but starting with dried soaked beans is key to what makes this dish so creamy and comforting. 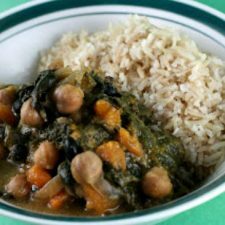 And this recipe has been updated with complete instructions for the slow cooker or Instant Pot, so take your choice on that. I like turkey Italian Sausage in this, which keeps the finished dish from being too high in fat, but I’m sure it would also be great with pork sausage as well. This is something I’ve been making for years with my garden sage; hope you enjoy! 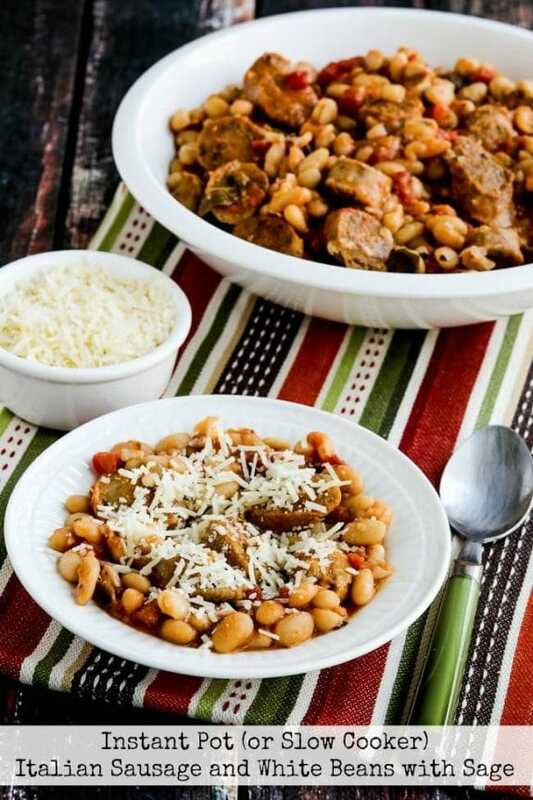 Get complete instructions for Instant Pot or Slow Cooker Italian Sausage and White Beans with Sage from Kalyn’s Kitchen. Click here to see all the Beans and Legumes Recipes! Click here to see all the Sausage and Meatballs Recipes!